This is a recipe I made over the weekend to have along with cheese and crackers as a little bite to go with some wine! Very good and very easy! Could be doubled or tripled to take to a pot luck or an event! 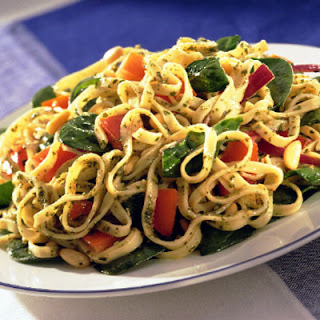 Combine pasta, spinach, tomato, onion and pine nuts in a large bowl. Combine pesto, lemon juice, salt and pepper in small bowl. Add pasta mixture, serve immediately or refrigerate. Sounds good! I make a very similar recipe using tortellini rather than linguine. It's such an easy dish to make and I think it's a perfect summer dinner. I'm in! Anything with pine nuts, tomato, spinach AND pesto sauce-Yum! This looks so good, I really like cold-pasta dishes so I would totally go the refrigerated rout! Thanks for sharing!